The Strommen Executive Speakers Series brings top executive leaders to campus to share their experience with alumni and students. Join us on Thursday, April 7 at 5 p.m. to hear Doug Baker, chairman, president and CEO of Ecolab, Inc.
Ecolab rose in the 1920s from humble beginnings: a product to clean hotel carpets, followed by a detergent for early dish machines. Today, the St. Paul-based company is a $6 billion global leader, providing products and services for cleaning and sanitation, food safety, and infection prevention. As the world becomes more crowded, food supply chains more global, and natural resources (especially fresh water) more scarce, the company sees major opportunities to make a significant difference in the quality of life for people everywhere. Hear CEO Doug Baker talk about how Ecolab aims to make the world cleaner, safer, and healthier—and to do it in ways that protect the earth's resources. Baker's career with Ecolab began in 1989 when he joined the company following seven years in brand management at Procter & Gamble. At Ecolab, he has held key roles in marketing, sales and general management in both the United States and Europe, and leadership positions. Baker has served as CEO since July 2004 and added chairman of the board to his duties in May 2006. 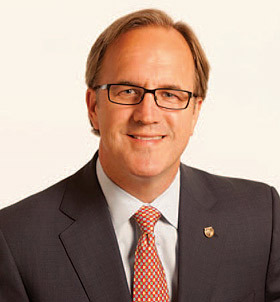 In addition to his Ecolab responsibilities, Baker serves on the board of directors of U.S. Bancorp. He is a member of the executive committee of the Minnesota Business Partnership, an organization of Minnesota's top 100 companies' CEOs focused on further enhancing the region's quality of life, and a member of the Minnesota Early Learning Foundation, an organization established to recommend cost-effective strategies to address the lack of school readiness among many of today's children entering kindergarten. In addition, Baker is a member of the Committee Encouraging Corporate Philanthropy (CECP), which is the only international forum of business CEOs and Chairpersons exclusively focused on corporate philanthropy. Baker is a graduate of Holy Cross College in Worcester, Mass., where he majored in English. He and his wife, Julie, and their three children live in the Minneapolis-St. Paul area.